Some interesting sites for crafts! Here are some freebies! And as always, if you happen to like the item, please write a thank you to the creator in the comments/guest book! It would probably mean alot to them to get some cool feedback! Cheers! If you have any fun and horrifying craft ideas please send them to me to post! I will try to update this space often! 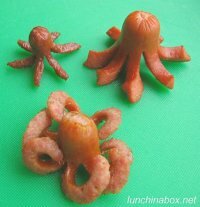 They are easy to make, I encountered them on a bento box cooking site. All you really need are hotdogs/sausages and a knife.